THE OLDEST MUSICAL INSTRUMENT IN THE WORLD. 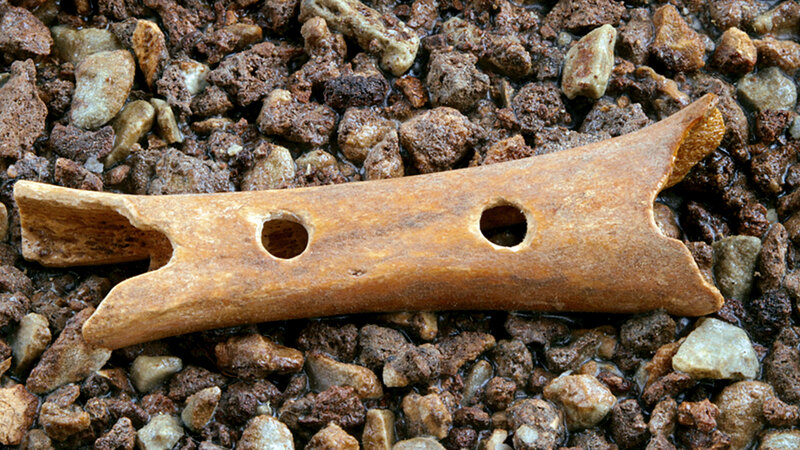 A TREASURE OF GLOBAL SIGNIFICANCE AND THE EVIDENCE FOR THE EXISTENCE OF MUSIC IN NEANDERTHALS. This famous discovery happened in 1995, when during the excavations performed by Ivan Turk and Janez Dirjec from the Institute of Archaeology ZRC SAZU, the world’s oldest musical instrument was discovered in the Mousterian layer. 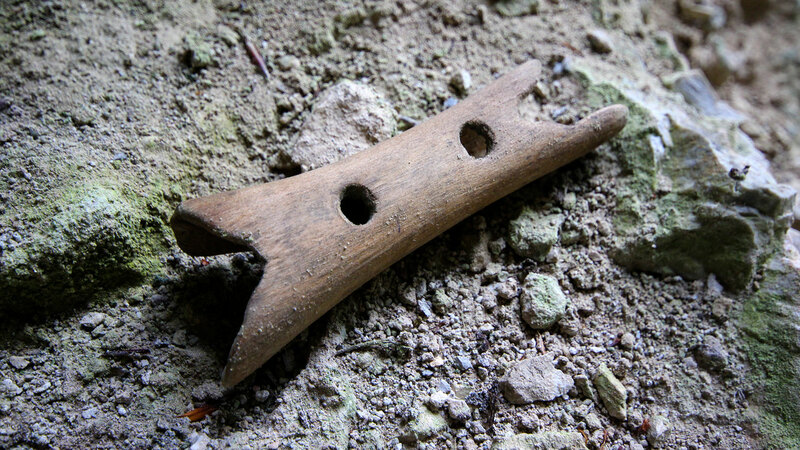 The Neanderthal flute from Divje babe, kept by the National Museum of Slovenia. Photo: T. Lauko. 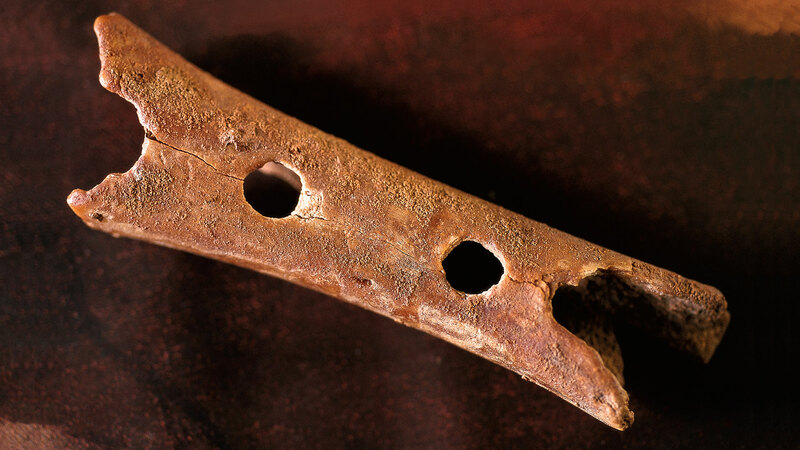 This unusual musical instrument, neither a flute nor a whistle, was cemented near the remains of a 50,000 – 60,000 years old Neanderthal fire pit, made from the thigh bone of a young cave bear into which the Neanderthal drilled three holes and made a sharpened rim for the mouthpiece using tools made of bone and stone. The natural shape of the chosen left thigh bone, its size and artificial redesign is ergonomically sound and adapted for a right-handed musician. Therefore it cannot be random. 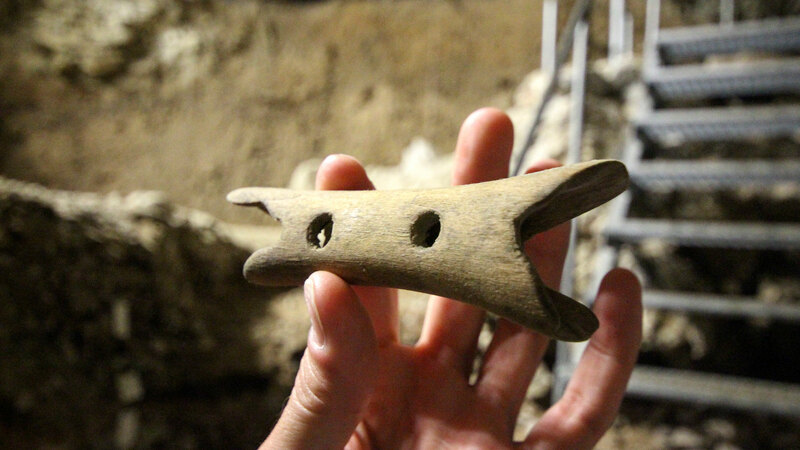 This incredible find from the Archaeological Park Divje Babe is at least 10,000 years older and significantly more capable than all other previously known Palaeolithic flutes in Europe made from bird bones by the first anatomically modern humans. That is why we cannot simply speak of a flute any longer, but rather of a musical instrument of a special kind, one which profoundly changed our views of the Neanderthal, who went extinct 30,000 years ago. This discovery represents pivotal evidence that the Neanderthal was, like us, a fully developed spiritual being, capable of sublime artistic creation such as music.